Television is certainly not new to the NFL, but social media and affordable wireless camera systems are. NFL fans are hungry for unique video content that connects them with their teams. New technology helps the league accomplish that goal. LiveU has partnered with another National Football League (NFL) team. In an agreement announced 29 Sept 2015, the Indianapolis Colts signed with LiveU to provide live video technology solutions to the team. About ½ the NFL league of 32 teams have similar but separate agreements with LiveU. The model has been gaining momentum with all NFL teams for the last 4-6 years. Since the first appearance of LiveU’s cellular bonding technology at the 2010 Super Bowl, LiveU has reported accelerated growth of the technology’s adoption in Pro-Football each year. At last winter’s Super Bowl XLIX, LiveU reported a 70% increase in the number of LiveU field units in use compared to last year’s game. Some other manufacturers have reported similar growth. At this year’s Phoenix game, a total of 85 LiveU units transmitted 4,460 GB of data and 1,785 hours of video for the event for dozens of participating stations, networks, and NFL teams. More of that video than ever was distributed on social media and team websites. Some clips were picked up by local news and sports stations. This LU500 is ready to backhaul some game day video. The Indianapolis Colts are using wireless video technology and the Internet to connect with their fans and local media. 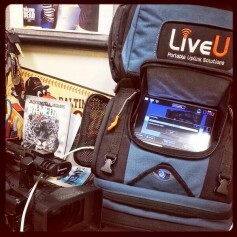 The team uses LiveU’s LU500 backpack transmission unit to cover live events such as press conferences, player airport arrivals, interviews and the like. The team also uses LiveU’s LU-Smart smartphone application so reporters and staff can use their iPhones, iPads, and Android devices to stream live. These abilities allow the Colts to instantly connect with its fans. The Colts stream unique, engaging content such as pre-game shows before each home or away game. The Colts make the most of LiveU’s wireless portability by using the show to take its fans on the field for discussions of timely topics. The team also uses the LU500 to capture behind-the-scenes content when on the road to continuously keep Colts fans connected to their home team regardless of location. By definition, fans are fanatic. “Pro sports and especially football,” according to LiveU’s Mike Savello, “is all about fan engagement and the opportunity to create more content. Fans want all the team and game information they can get. Everyone is looking for additional content.” During playing seasons, potential media content is occurring nearly all the time. The goal is to capture the magic, post it in clips, stream it live, or both. The primary audience is always in anxious anticipation. The NFL's Houston Texans first recognized this trend and signed an agreement with LiveU to provide live video transmission technology in October 2011. Since then, demand for content has increased rapidly for traditional TV and online media. To maintain a competitive edge, increase media coverage and cross-promote other assets, teams must create much of their own content. A team’s primary content is usually on its website. It must use social media to promote it and twitter accounts to promote live press conferences with coaches or players, and other live streaming content such as a team’s airport arrival. Wireless technology makes fast video streams possible. NFL team video channels differ in numbers and names. Actual numbers are +- a couple because some teams don't call their live streams, such as press conferences, a channel. Sports is all about statistics, so let’s take a look at some league stats. In an unsanctioned, unofficial, impromptu NFL World Team Website Video Channels Championship, the NFC would pound the AFC 233 to 221, not even counting videos on the NFC Rams website which are sorted by date instead of channels. The winning team is the Green Bay Packers, with 21 video channels. The Colts, Patriots and Cardinals were all in the basement with 7 channels each. How NFL teams post their videos was also interesting. About half NFL team’s websites are somewhat uniform, others are very different. About the only uniformity between AFC and NFC teams is that all team websites are called “The Official Website of the (Team Name).” Browsing through videos on each team’s website reveals that NFL teams call their video channels by 11 different names. The Dolphins, Broncos, Bears, Cowboys and Titans post their videos under a “Multimedia” banner. The Texans call their channels “Texans Video.” The remaining 10 teams post their channels under a “Video” or “Videos” banner. All but the Rams' websites serve up similar fresh videos in similar categories. The Rams have plenty of clips, but they're organized by date, not in channels. The Kansas City Chiefs website is about average. It posts relevant, up-to-date videos on approximately 16 video channels at http://www.kcchiefs.com. Most are also available in audio-only streams as well. Most Chiefs channels average about 12-25 clips each, usually of various lengths, many produced quite recently. Together, all the Chiefs’ video channels provide hours of the content fans crave, updated as frequently as possible to keep it fresh. The Chiefs' "Arrowhead Update" channel as it appears on kcchiefs.com. In the case of the Chiefs, the “Arrowhead Update” channel contains discussions about the next game. The “Blueprint” channel details plans for the season or upcoming season. A “Cheerleaders” channel is popular all year, as is the “Chiefs Kingdom” channel which contains compelling stories about outstanding Chiefs players. “Chiefs Live” streams pregame shows about its next opponent. “Chiefs Replay” channel contains key recent game plays with interviews in clips divided by game quarters. “Chiefs Rewind” is filled with post-game interviews and highlights by the week. “Chiefs Today” clips talk about upcoming games. The Chiefs’ “Community” channel shows clips of players visiting schools, institutions and locations. The “Highlights” channel contains more highlight reels and short clips. The team has a “History” channel with team history and star player bios. The “Hy-Vee Chiefs’ Insider” channel is a sponsored series of coach, player and opponent interviews usually focused on the next game. “Under the Helmet” clips are in-depth interviews with players. The “Play Breakdown” channel shows clips of great recent plays without audio. The “Wired” channel shows action clips with isolated audio from on-field player mics. There’s also a “Press Conference” channel. No matter what name each team calls them, video clip channels are all the rage among NFL teams and fans. There’s simply not enough broadcast time for any NFL team to feed its fans all the team and player minutia they hunger for on TV. The Internet, smart phones and wireless technology are providing plenty of fuel needed to keep fans excited, on-line and in-the-loop with their favorite team, in near- or real-time. All the fans need is time, curiosity and an Internet connection.